When your daily responsibilities and stresses leave you in need of a getaway, there’s nothing quite like an escape to the Hocking Hills of Ohio. It’s the perfect place to restore your mind and body in the tranquility of nature! Plus, our Hocking Hills State Park cabins are very popular accommodations for couples and families seeking a secluded getaway. 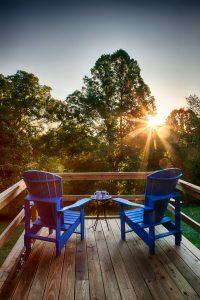 Whether you choose to relax together on your cabin’s porch or explore nearby attractions, we promise you’ll return home feeling completely rejuvenated. Find out more about our Hocking Hills State Park cabins and fun things to do during your stay by requesting your free copy of our Vacation Guide! This handy planning tool is filled with all the best recommendations for local activities, dining, shopping, entertainment, and more. Get your copy today. The Inn & Spa at Cedar Falls is proud to offer five luxurious cabins right outside of Hocking Hills State Park. Boasting marvelous views and distinct characteristics, each cabin rental is the perfect place to relax and unwind. They also include the extra special touches that you expect from a Select Registry accommodation, including quality coffee, fully-equipped kitchens, plush robes, fine soap, and more. Explore our beautiful Hocking Hills, Ohio, cabins below and book your favorite! When you’re not de-stressing in your home-away-from-home, there is a multitude of exciting things to do in and around Logan, OH. Here are just some of our guests’ favorite activities that we know you’ll love as well! Wine and food lovers alike will find a unique selection to delight their taste buds at the Hocking Hills Winery. This local vineyard has approximately 2,000 vines covering four acres and produces an excess of 12 tons of grapes annually. Visitors can tour the vineyards, sample different flavors, and attend a variety of annual events to learn more about the fascinating grape-growing and winemaking process. The winery also offers a variety of tasty finger foods such as meats, cheeses, and crackers as well as space for guests to grill their own lunch. The Spa at Cedar Falls is a secluded and intimate Hocking Hills retreat that restores your mind, body, and spirit. The thoughtfully created environment and woodland setting provide guests with a soothing, peaceful atmosphere to decompress and let worries melt away. Our professional massage therapists will cater your appointment to fit your individual needs and ensure you receive the care that you deserve. Miles of awe-inspiring hiking trails and stunning natural features make Hocking Hills State Park our region’s most popular attraction. From the moment you wander into the forest, your inner nature-enthusiast will come to the surface. Since the Inn & Spa at Cedar Falls is surrounded on three sides by the park, we strongly encourage our guests to get out and experience what this beautiful area has to offer. Check out some of our favorite Hocking Hills State Park attractions that you won’t want to skip! Hocking Hills State Park cabins are just one of many incredible lodging options available at the Inn & Spa at Cedar Falls! Whether you stay in a rental cabin or Pacific-style yurt, you’ll be able to enjoy a wide variety of amenities and features including the award-winning Kindred Spirits Restaurant and a complimentary hot breakfast each morning. Check our availability and make your reservations today! We look forward to welcoming you soon.